Podolski did anything at all on Tuesday. 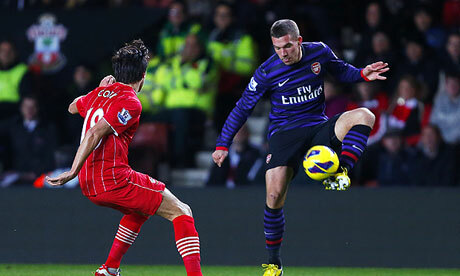 2013 did not exactly get off to the best of starts given Arsenal's lackluster 1-1 draw at Southampton. It was the kind of match from which a team hunting for the top four is expected to take all three points. Arsenal controlled the opening exchanges, but once Southampton got a footing in the game, the Gunners disappeared. It was abysmal, unacceptable, and hugely disappointing. The trials and tribulations of the league are set aside for now, so we can focus on the MAGIC OF THE FA CUP (with Budweiser!) My magic of the Carlsberg (as I alluded to in the Newcastle preview's intro) ended in the second half of that match, when Arsenal scored six times while I had to drink something else. The magic of the button-down shirt ended on Tuesday. So now I'm back to having no good luck charms, but I'm not about to start drinking Bud either. Perhaps I should just drink whiskey. THE MAGIC OF THE FA CUP (WITH JAMESON!) Thoughts? Ignore the fact that it'll be 8 in the morning. Back to the matter at hand, this is a huge match for both sides, and given the fact that Swansea thoroughly deserved their 2-0 win at the Emirates in December, it's a tricky draw for the Gunners. The FA Cup is currently Arsenal's best (and probably only realistic) shot at silverware this year. This match cannot be taken lightly. First (like a) new signing of the January window. A weird combination of team news came out of yesterday's presser. 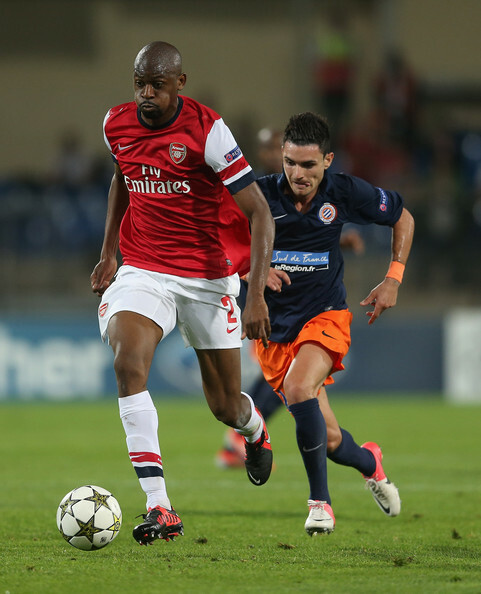 The good news is that Abou Diaby is back in training, after two to three weeks became 12. Andre Santos is back in training as well, and while you may not consider that the best of news, there's nothing wrong with depth at a position. Most of the problems with Arsenal's squad, however, revolve around the quality of that depth... in that there is no quality. Anyway, the weird news: Vito Mannone is out through illness, and so is Emmanuel Frimpong, whom I did not realize was only on loan until January. First and foremost, why in the hell is everybody getting sick? Does Arsenal not pay for everyone's flu shot? Second, on the subject of Frimpong, he only played six matches for Charlton Athletic, and was subbed off in five of them. That is now two unsuccessful loan spells for the kid and you have to start wondering if he's running out of chances to make an impression at Arsenal. As for the rest of the presser, here are some choice Wenger phrases: "we will put our maximum effort in," "I'll play the team that I think has the best chance to win the game," and "It will not be based on the fact that it's purely rotational." That all sounds like Wenger-speak for "I'm going to rotate a little." Mannone's illness leads me to believe he will not rotate in goal; if Wojciech Szczesny started at Bradford, he has to start at Swansea. The most likely spot for rotation is in the midfield: Tomas Rosicky, Aaron Ramsey, and Francis Coquelin could all probably use a start. Olivier Giroud could use a start, too. The problem is, with no depth, as I alluded to earlier, you can't rotate too much and expect to win. And, as I also said before, this isn't a match Arsenal can afford to take lightly. Swansea City have a largely clean bill of health, now that Michu has returned from injury to give us all nightmares. Just one long term injury for the Swans, to Welsh defender Neil Taylor, who is out for the season with a broken ankle, which he suffered in his first game of the season after returning from Team GB. The question of rotation comes up with Swansea too, though, since they are still in the Capital One Cup and face Chelsea in the first leg of their semi-final this midweek. Since the start of the festive period, Swansea have been playing two matches per week. Their next midweek break would come the week of Monday, January 14, though even that break disappears if this cup tie goes to a replay at the Emirates. In other team news, defender Alan Tate, who missed most of last year after breaking his leg in a golfing accident, extended his loan spell at Leeds United by another month. Swansea were unlucky not to take all three points on Tuesday. So was Southampton, to be honest. A lot has changed since Swansea won 2-0 at the Emirates just over a month ago. Arsenal bounced back, kind of, despite losing on penalties in the Capital One Cup to lowly Bradford City. Arsenal had won four straight in the league, scoring 15 goals in the process, before Tuesday's turgid 1-1 draw at Southampton. It should be noted that Arsenal won two of those four games solely on goals from the penalty spot. With Arsenal's goal on Tuesday coming via a Saints own goal, it means Arsenal have scored from open play in only two of their last six league matches, scoring 12 times in those two. As for Swansea, they have only won once in the league since winning at Arsenal. The following week, they lost a wild 4-3 match at home to Norwich. A week after that, they lost 1-0 to Tottenham. Then, they were able to sneak a 1-1 draw with Manchester United at home. This was inexplicably followed by a 0-0 draw with Reading on Boxing Day. They then beat Fulham 2-1 (without an injured Michu) before also suffering a draw on Tuesday. Swansea dominated that match against Aston Villa but nearly lost 2-1 before Danny Graham's 94th minute equalizer salvaged a point for the Swans. Kieran Gibbs has just realized he's been left home alone. Entering this season, Arsenal and Swansea had evenly split all six of their prior league meetings; Swansea's 2-0 win in December, in which Michu scored in the 88th and 90th minutes, gives the Swans a 4-3 advantage all-time in league play. But, this is not a league match, so let's talk about cup ties, shall we? In 1980, Arsenal and Swansea met in the second round of the still sponsorless League Cup (it was still two years away from being called the Milk Cup.) Swansea picked up a 1-1 draw in the first leg at home before losing 3-1 at Highbury in the second leg. Arsenal went on to lose to Spurs in the fourth round; Liverpool went on to win the cup. The two sides met in three FA Cup ties prior to that. Swansea (then known as Swansea Town) won the first meeting, 2-1 on March 6, 1926, in the sixth round. That win earned Swansea a trip to the semi-final, which they lost to the eventual champion Bolton Wanderers. In 1950, the two sides met in the fourth round, which Arsenal won 2-1, en route to winning the cup. The sides met again in 1968's fourth round, with Arsenal winning 1-0 in Wales. Arsenal lost in the next round against Birmingham City in a replay. That's a handball! Howard, that's handball! PENALTY! The referee is South Yorkshire-based Howard Webb, and, given the magnitude of this match-up compared to the other ties of the weekend, that should not be surprising. Arsenal have won twice in their two matches with Howard Webb in the middle this season: 2-0 at Liverpool in early September and 5-2 over Tottenham at the Emirates in November. Last season, Arsenal won matches over Sunderland, Everton, and Newcastle at the Emirates with Webb, but also lost 8-2 at Old Trafford and, perhaps more relevantly to this match, were knocked out of the FA Cup 2-0 at Sunderland with Webb presiding. This cup is made of MAGIC. Saturday's early match, the first of the round, sees 9th place Championship side Brighton & Hove Albion host Newcastle United at the AMEX. Saturday's late game features West Ham hosting Manchester United at Upton Park, in one of the four all-Premier League ties. Swansea v. Arsenal is Sunday's early match; it will be followed by Liverpool playing away to Conference side Mansfield Town. Monday night's match-up sees Everton playing away to League Two's Cheltenham Town. As for the 27 other games, here goes, alphabetically by home side: Aldershot Town hosts Rotherham United, Aston Villa hosts Ipswich Town, Barnsley hosts Burnley, Blackburn hosts Bristol City, Bolton hosts Sunderland, Charlton Athletic hosts Huddersfield Town, Crawley Town hosts Reading, Crystal Palace hosts Stoke, Derby County hosts Tranmere Rovers, Fulham hosts Blackpool, Hull City hosts Leyton Orient, Leeds United hosts Birmingham City, Leicester City hosts Burton Albion, Luton Town hosts Wolves, Macclesfield Town hosts Cardiff City, Manchester City hosts Watford, Middlesbrough hosts Hastings United, Millwall hosts Preston North End, Nottingham Forest hosts Oldham Athletic, Oxford United hosts Sheffield United, Peterborough United hosts Norwich, QPR hosts West Brom, Sheffield Wednesday hosts MK Dons, Southampton hosts Chelsea, Southend United hosts Brentford, Tottenham hosts Coventry, and Wigan hosts AFC Bournemouth. The fourth round will be played in three weeks.